By taking a DISC assessment, you're already a step ahead in learning to communicate more effectively with others. Your assessment results provide great insights and strategies and are essential to better understanding your preferred behavioral and communication style. But … they are only the first step. What if you could get even deeper insights into how to use the DISC model? The DISC model is only truly effective when you understand how to adapt your communication to another person's style. When you learn how to adjust and modify your words and actions, you will be more quickly and more clearly understood and heard by other people. Think about it: Is there one person at work who you simply don't get? Or maybe there is someone who does things so differently from you that you find it hard to relate to him or her? The DISC model is truly a map to understanding human behavior. But in order to use it fully, you must not only be aware of your DISC style, but also the DISC style of the people around you, and how to use that awareness to tailor your communication accordingly. Based on your communication style, the program includes a series of videos and corresponding learning materials that help you further understand and utilize your assessment results by providing specific and actionable techniques for adapting your communication style. So whether your primary style is D, I, S, or C, you'll get an in-depth look at how your communication style best works with every other style. Adjusting your words, behaviors, and tone to best fit how others receive information. Objective, non-judgmental words and phrases to implement into your daily communication, resulting in improved, more engaged understanding. Specific ways to change your communication approaches so that you can connect with others in better ways. Insights into how to become a better communicator and presenter based on your behavioral style. What you can do and say to put your best foot forward with all kinds of people. How to work with your strengths and make adjustments for your blind spots. If you're ready to fully understand your personal style, begin taking positive, intentional actions that increase effective connections and communication with others, and stop wasting time deciphering other people's meanings behind the messages, then this training package will be the best personal investment you've made ALL YEAR. Pick the Training That Fits You Best! This learning package is for people with Dominant (high-D) behavioral traits. If you have high-D traits, this package will give you the insights you need to get better results from your communications and interactions with others. It includes both a DVD with informational videos and a printed reference guide. This learning package is for people with Inspiring (high-I) behavioral traits. If you have high-I traits, this package will give you the insights you need you need to create More Engagement in your communications and interactions with others. It includes both a DVD with informational videos and a printed reference guide. This learning package is for people with Supportive (high-S) behavioral traits. If you have high-S traits, this package will give you the insights you need you need to create stronger connections in your communications and interactions with others. It includes both a DVD with informational videos and a printed reference guide. This learning package is for people with Cautious (high-C) behavioral traits. If you have high-C traits, this package will give you the insights you need you need to get greater clarity in your communications and interactions with others. It includes both a DVD with informational videos and a printed reference guide. We are confident that you will find great value in the Using the DISC Model to Connect and Communicate training package. We have been working hard for many months to assemble the right resources and information to make this training report useful, thorough, and easy to use. We believe in the product. We personally use the product, and we are happy with our results. And we are not you. 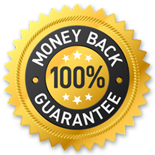 If you are unhappy with the training package, we will happily refund your full purchase price. Insight into the perspectives of other DISC styles. How I can better understand the viewpoints of people who have a DISC style different from mine. How I can adjust my words, behaviors, and tone to create a better connection with other people. Select your style to get specific information for people of your style to better connect and communicate. You can select more than one style if you'd like. Many people get the training packages for their two strongest traits. Pick the style(s) that fit you best! I want all four styles.